RSM Marketing, parent company of 360Ideas, positioned Dan Madrigal and his team as being relatable, hard-working experts who are willing to share information to get their clients the best possible deal. A true triple threat in real estate! 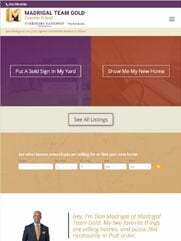 After reviewing competing websites, it was clear that many were difficult to navigate, so simplicity was key with the site redesign. 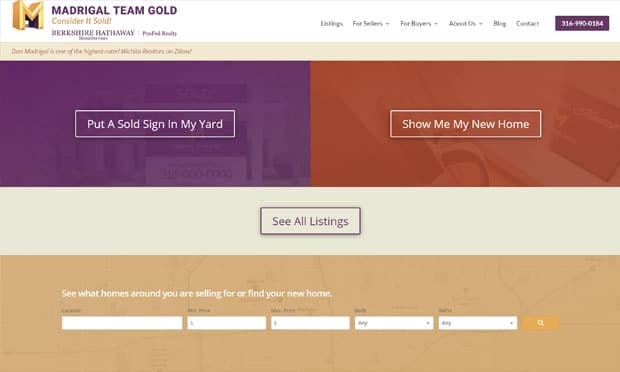 The user interface for Madrigal Team Gold was focused on the visitor and their interest, whether the buyer or seller. Right up front, the visitor can choose and have an experience focused on their interests. The site was built with several lead magnets that provide information in exchange for the user’s contact info. 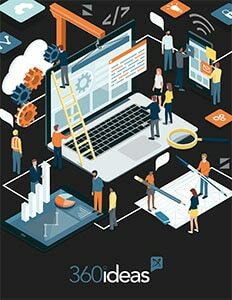 The site’s intuitive navigation and vibrant, modern design make it a striking exception to most other websites in the industry. Madrigal Team Gold had a very successful first-year launch thanks to their new website and many off-site and turnkey tactics provided through RSM’s Outsourced Marketing Department subscription for Madrigal Team Gold. Learn more about potentially outsourcing your marketing department here.